Lyft’s forthcoming premium SUV service will cost twice as much as normal Lyfts, but comes with extra perks, says a Lyft contractor who refused to be named as the plans are still private. I scooped the upcoming launch of Lyft’s competitor to Uber SUV earlier this month before Lyft released a teaser page for the service. Now I have more details on what the luxury Lyft experience will be like. [Update 5/8/14 10:20am PST: Lyft has now published details of its SUV program, confirming my report here that Lyft SUVs will cost about twice as much as standard Lyfts, hold six passengers, feature diamond-stiching leather interiors and ground effect lights (though not necessarily red ones) installed by car shop West Coast Customs, offer phone chargers, and they’re launching in San Francisco. Our source says the cars may also have other special features like charging ports for smartphones in the back, or even iPads to play with, but they weren’t as sure of this detail. For reference, Uber recently distributed these USB charger seat hangs (apparently bought from Delta) to their SUV drivers in New York. What we do know is drivers will get a $750 bonus per month for their first year, but must drive a minimum of 35 hours per week. For the first few months, Lyft will forgo its typical 20% commission from the fares passengers pay so drivers get 100%. The hope is the extra money will lure drivers to the SUV program. After that, the 20% tax will kick back in. Lyft SUV will cost passengers twice the standard rate. If you double Lyft’s SF price, the SUV would come out to $5.50 pickup + $2.70 per mile + $0.54 per minute with a “safety” fee added. You can compare that to Uber’s SUV price in SF: $15 pickup + $3.75 per mile + $0.90 per minute. For a 2 mile, 10 minute ride, Lyft SUV would cost $16.30 + fees, while Uber SUV would cost $31.50 + fees. So Lyft would be significantly cheaper, especially for fast rides without traffic. Uber SUV’s high per minute rate stacks up when stuck in gridlock. Maintaining a sizable discount versus Uber SUV could be a draw for Lyft’s cutesy clone. Users will sacrifice some legroom in the back row, and the power of commanding a glamorous black and silver tank with a professional chauffeur. While Uber’s Escalades and Navigators fit 7 passengers comfortably, Lyft’s Explorer fit 6 and it’s cramped in the back row. It’s unclear whether there will be a buyback program to let drivers sell their cars if they want to stop driving. Exactly when the first SUVs will roll out is unknown as well. [Update: It launches today, 5/8/2014]. 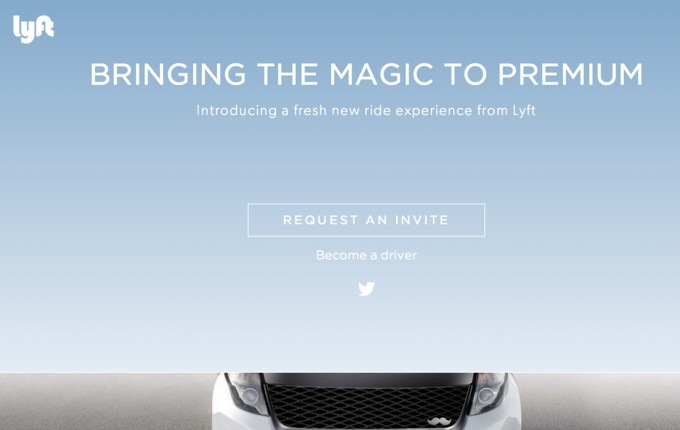 The real question will be whether Lyft can merge its friendly style with a premium price point and fancier rides. Though it might repulse those wanting an elite car service for one or two people, Lyft may find its sweet spot with playful party buses.